The Toronto Maple Leafs have traded three draft picks to the Chicago Blackhawks for centre Dave Bolland. We'll give up #51 and #117 this year and our 4th round pick in 2014. 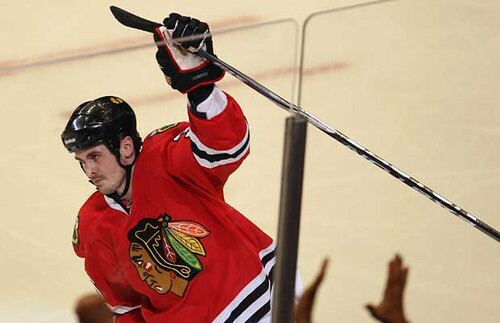 Bolland, 27, scored the Stanley Cup-clinching goal for the Blackhawks less than a week ago. We're still looking for a #1 centre, so if you're a #1 centre and interested in playing for the Leafs, David Nonis would like to have a word with you. Bolland is an upgrade for Bozak with less cap hit as Tyler UFA this year wanting a lot more $. How about Schneider for only 1st round pick - Bobby Lou must be peeved as he wanted out of Vanc. especially with Torts new head coach. Vanc. GM Gillis is a JOKE!!!!! Well, hopefully this won't take the Leafs to the cup. Hopefully my Habs can still win. Mike I'm surprised you haven't said anything about the pending Bargnani deal. Just waiting for the i's be be dotted and the t's to be crossed.